A single viral tweet last week shone a light on the huge chasm opening up in British politics. It revealed the results of an ICM poll showing 73 percent of voters between the ages of eighteen and twenty-four backing the Labour Party in the upcoming general election, with only 15 percent backing the Conservative Party. The corresponding statistic expressed the opposing intentions of the elderly; among the over-sixty-fives, only some 20 percent will cast their votes for Jeremy Corbyn’s party, with 64 percent backing the incumbent Tory government. A series of polls produced this weekend made it clear how important this would be for the general election. With the raw data similar across the six companies who surveyed, the Tory margin varied from double digits in ICM and ComRes to four points with YouGov and a single point with Survation. The difference owed to whether the pollsters believed young voters would turn out on June 8. It wasn’t always like this. Even as they won elections in 1997, 2001, and 2005, Labour only won the youth vote by between 10 and 18 percent. In the most recent election they won under-twenty-fours by only sixteen points. So what is behind today’s dramatic surge in their youth support? From the moment Corbyn made it onto the ballot to stand for the leadership of the Labour Party, his campaign was characterized by an explosion in youth involvement. In an internal debate where every other candidate was effectively on the same page in terms of austerity, the direction of the party and the future of the country, the long-term left-winger was singing from a different hymn sheet. Corbyn’s promise to bring about a new, more democratic politics, his principled opposition to war, and his record campaigning against austerity offered what seemed to be a new path in British politics. Hearing Tristram Hunt on the Today programme yesterday, plumming off about how Corbyn supporters want to return to a “comfort zone of Labour politics” and how if Corbyn wins Labour will become little more than a “pressure group” because being an “anti-austerity populist party isn’t going to get us into government” didn’t make me “see sense” as Hunt probably intended. It just made me think, “Screw you all, you don’t deserve to be in government.” From what other young new Labour recruits have been telling me, I’m not alone in thinking this. The sneering attitude of senior Labour figures greatly helped Corbyn’s rise, with young people resenting the idea that they should vote for the party at election time but have no meaningful say over its policies, structures, or leadership. The spirit and vigor of the “Corbyn summer” was a marked difference to the 2015 Labour general election campaign. When, in early 2015, it was revealed that approximately a million voters — the vast majority of them under thirty — had vanished from the electoral register, the response of Ed Miliband’s Labour was characteristically half-hearted. The “Shape Your Future” project headed by the MP Ivan Lewis sought to create a “manifesto for young Britain,” but delivered the sort of drab and unsatisfactory wonkery that characterized the triangulating leadership. In pledging to destroy unemployment benefits for under-twenty-ones and maintain Tory education cuts, Labour’s pitch to the young received scant enthusiasm. A bump in the youth vote would have deprived the Tories of a majority in 2015. But in the end it was no surprise that a mere 40 percent of young people turned out to vote. As a bitter lesson learned, those behind the Corbyn campaign in 2015 produced a vibrant and engaging youth manifesto. In addition to scrapping tuition fees and capping rents, it promised a reversal of grant cuts, an end to discrimination against young people in benefits, and a statutory living wage for all. True to his word, these proposals are now to be found in the party’s 2017 general election manifesto which, if implemented, would immensely improve the quality of life for young people in Britain. The two years since the leadership election were more challenging for Project Corbyn — but it retained a strong youth support throughout. Corbyn-supporting pressure group Momentum provided an avenue for many that had previously been active in campaigning, a reality that was brought home by the young profile at the World Transformed conference it organized during the Labour Party conference. But Young Labour groups inside the party also flourished and, with Corbyn-supporting candidates winning election to national positions, the organization backed him solidly in his reelection campaign. Recent months have seen younger activists focusing on the general election, with a hugely successful voter-registration drive. As a partial result of their work — and of the enthusiasm generated on social media by the campaign — over 1.05 million young people have been added to the electoral register since the election was called. During the campaign itself, Momentum has taken this to a new level. Its array of election interventions have included bringing in full-timers from the Bernie Sanders campaign to conduct canvassing workshops; flooding marginal seats with young, enthusiastic canvassers through a new app; and facilitating online phone-banking for its members. Other groups have also grown in significance, such as the Young Labour Trade Unionist Network, which organized local and national days of action for union-sponsored MPs. Popular culture has also been influential. The Grime4Corbyn campaign brought prominent figures from Britain’s most popular music scene together to not only endorse Labour but campaign for voter registration and spread the message of the party’s manifesto. Corbyn himself also spoke at cultural events, including a Libertines concert in Wirral, at the home of Tranmere Rovers Football Club, where he was greeted by an audience of young supporters chanting his name. Distant, it seems, are the days when Labour could merely muster TV hardman Ross Kemp (who backed the coup against Corbyn in 2016) or tiresome Blairite comedian Eddie Izzard to rally the cause. In cultural relevance and dynamism the Corbyn campaign will be remembered for outdoing Red Wedge, the eighties movement once seen as the height of cultural intervention in electoral politics. But will it be enough? Almost two-thirds of young people described themselves as “certain” to vote in a recent poll, a marked improvement. But it would still not be enough to overcome the gap to the Tories. The final third of young people who disproportionately back Corbyn’s Labour but aren’t yet convinced of the utility of voting for it must be won over too. And there are plans in place to make it happen. A plan is already underway to mobilize huge numbers of Labour activists on election day — the party has called on as many as can do so to take the day off — and target particularly turnout among young voters in marginal constituencies. But even if the Tories win on June 8, the conditions that created this upsurge in youth support for left-wing policies won’t subside. Rather, the battle will move into new arenas, with an urgent need to build campaigns to resist their most egregious anti-social measures. Any attempt to turn the clock back on Labour’s current political vision, to shift the party back from one that proposes real social change to one that aims merely for technocratic governance, will be resisted by the hundreds of thousands of young people energized by the campaign. This base, not the media commentariat or the professional political class, offers the party its best hope for the future. Social-democratic parties across Europe are in decline. France’s Socialist Party are at 6 percent, Labour’s counterparts in Holland and Ireland around the same, the much-heralded Schulz-led Social Democratic Party in Germany and Spain’s Socialist Workers’ Party flounder at 23 percent and 22 percent respectively. 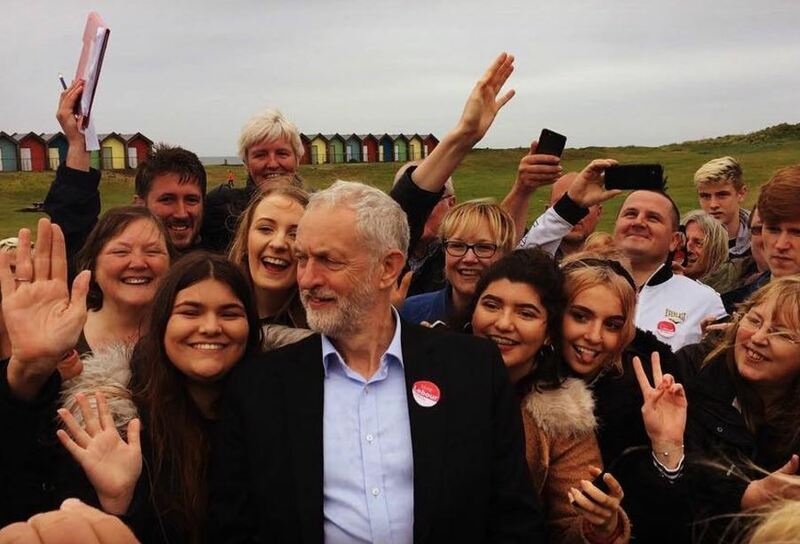 Under Jeremy Corbyn the Labour Party is comfortably ahead of them all and — with such strength among younger voters — has something to feel optimistic about in coming years. Labour’s development into a party with a twenty-first-century, modernizing socialist platform has, despite all odds, been a successful one. The party is being rewarded especially for offering an alternative for young people, and a path for their reengagement in politics. A better future is possible. On June 8 we’ll see how close it is.